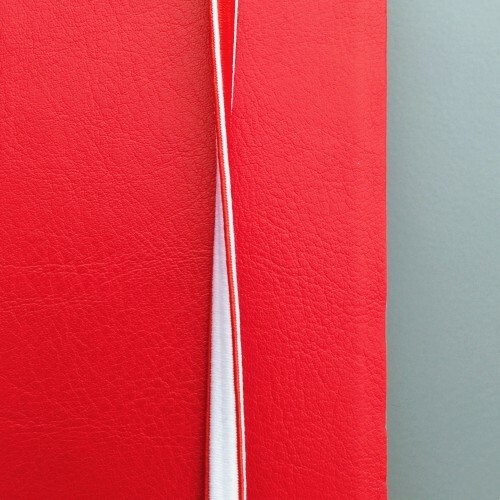 I bought this leatherette-covered notebook from Goulet Pens. The price was $18.95 and I paid with my very own pennies. Yes, this is a lot for a notebook, though it is refillable and that helps. Measuring in at just around 6.33″ x 8.4″, this notebook is a handy size that will fit comfortably into larger sized handbags and totes. 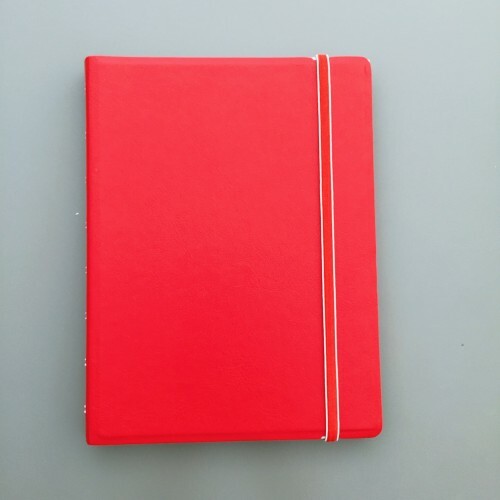 Mine is a bright and cheery red with a faux leather textured cover. The cover is over a thin and somewhat flexible bookboard. There is no off-putting scent to the cover – that is, it doesn’t smell like cheap vinyl. 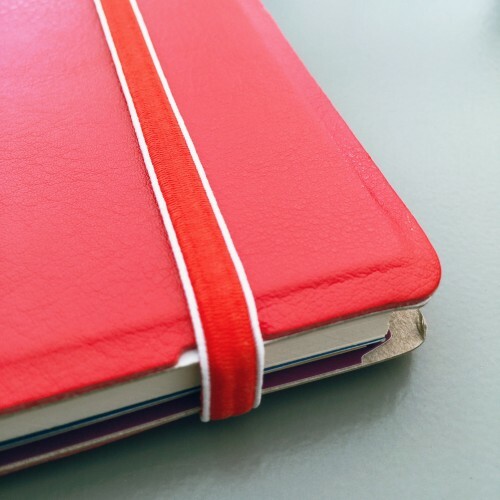 The elastic band is red with white trim on one side and vice versa on the reverse. 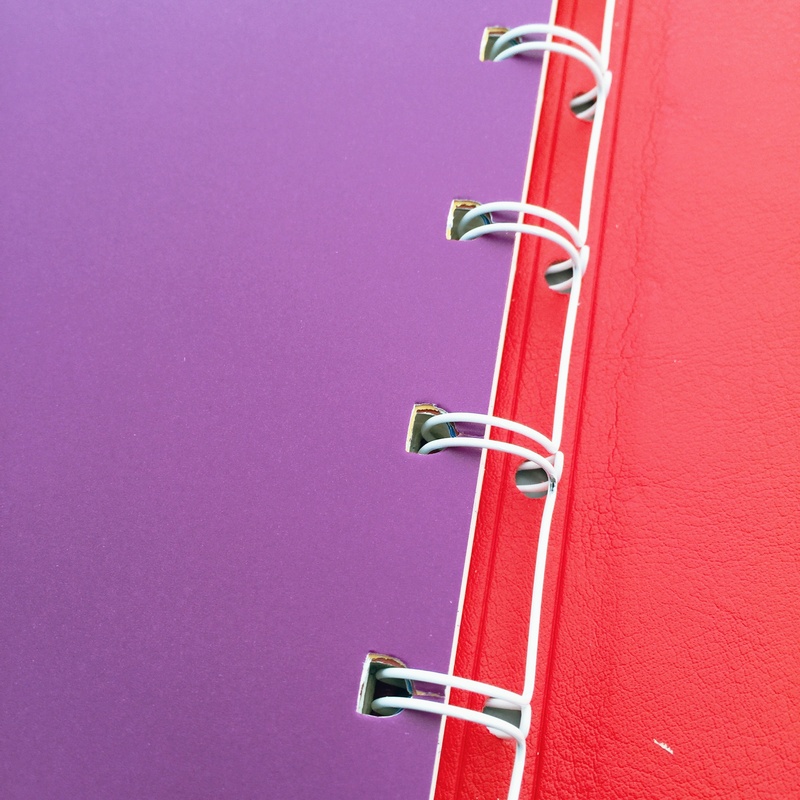 The band itself is super high-quality – I don’t remember seeing such a nice band on any other notebook or planner. The front and back covers are notched – this assures that pressure from the band doesn’t damage the cover. I immediately noticed the use of cardboard stiffeners in the front and back of the book and was concerned that this meant the cover and paper would be low-quality. Not the case at all. With the stiffeners removed, the book is somewhat bendy – and that’s a very good thing because the entire thing can be wrapped around itself – cover to cover. Love this feature. The Filofax has a semi-concealed wire-o (twin wire) binding. The only way this could be improved upon would be if the wire was colored to match the notebook cover. 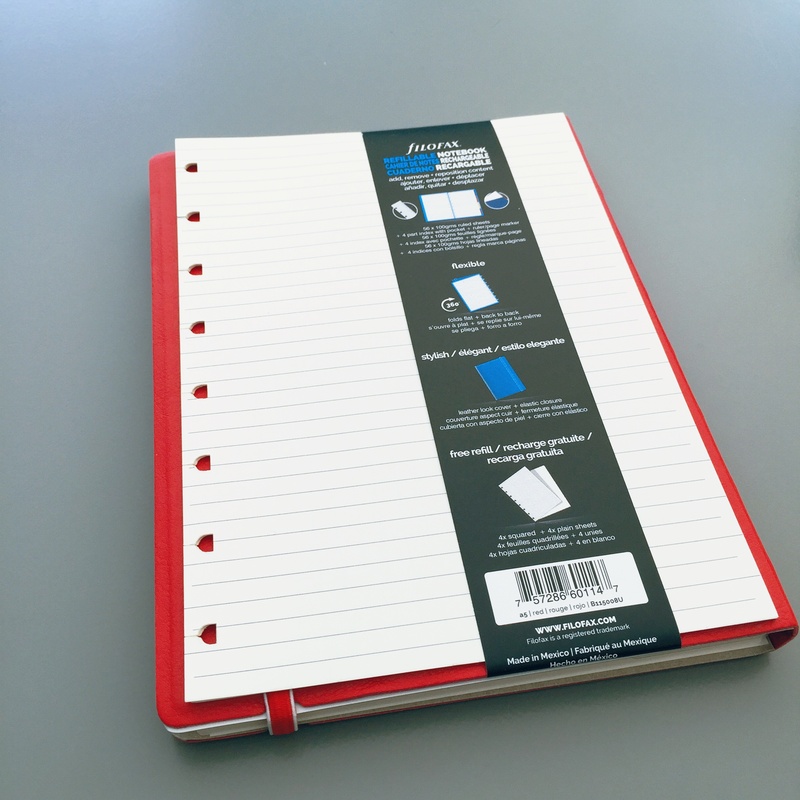 This Filofax A5 Notebook also has a nifty (and very flexible) ruler/bookmark and four repositionable tabs. 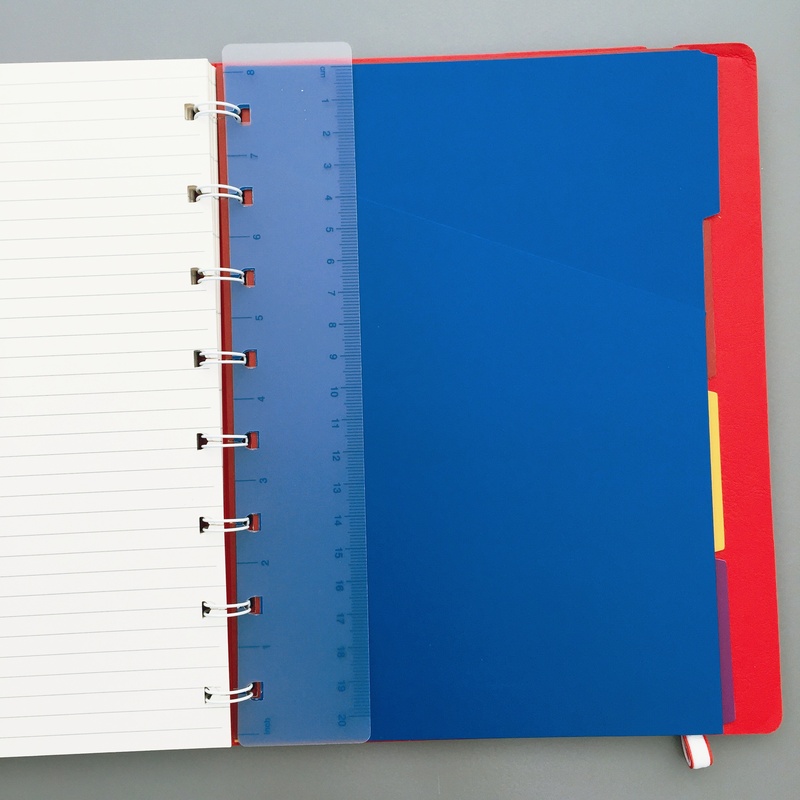 The blue tab has a pocket – he pocket could have been cut deeper to make it easier to move papers around (and prevent tearing). The other tabs are red, yellow, and purple. Even before writing in it, I was super-duper impressed with the quality and features of this notebook. So much to love. 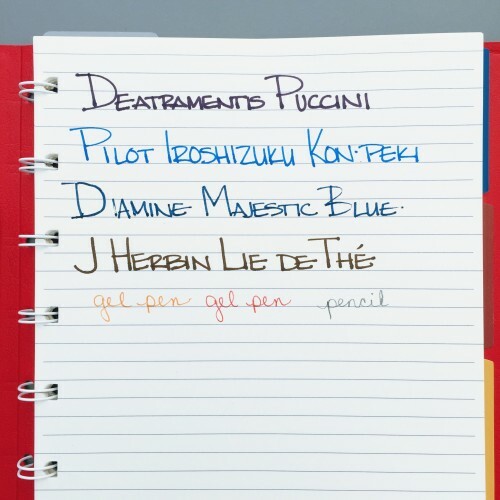 Hopeful, I grabbed a bunch of nearby pens and even one of Mr. Pentulant’s pencils . . .
Here’s a close-up of the writing. . . Turn the page and . 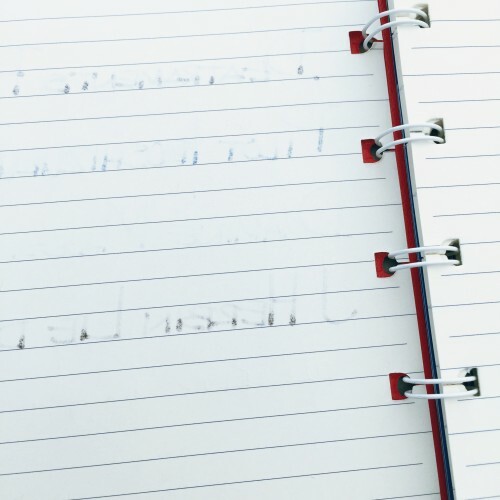 . .
Yikes…there’s quite a bit of show through (ghosting) with the fountain pens that would most likely be a deal-breaker for those who write on both sides of the paper. 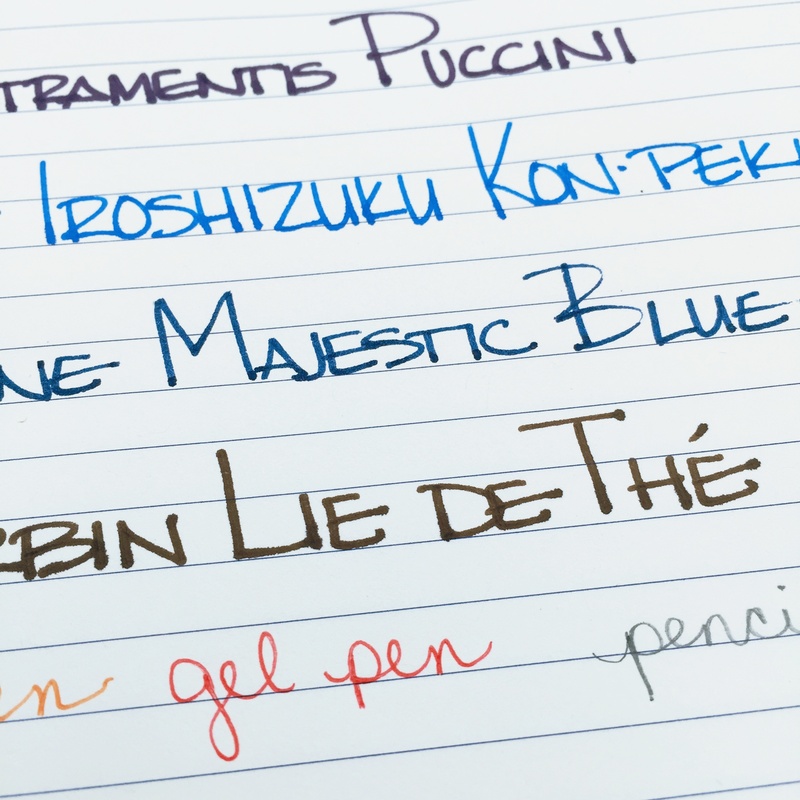 (The fountain pens I used were medium and broad nibs.) There were no issues with the gel pens or pencils, and there was no bleeding through to the next page with any of the pens. 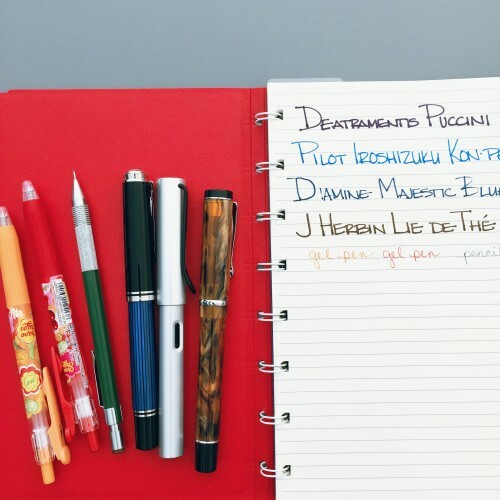 I later tested the paper with a fine nib (Lamy Safari) and while there was still some show through, I think most people could tolerate it. Probably. Maybe. I don’t know. Here’s my bottom line: I love this notebook. 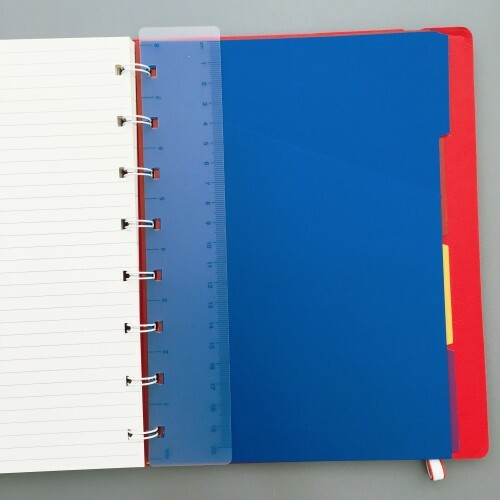 It has so many features that I want in all of my notebooks (the flexible cover, the pretty band, the tabs) that I’m going to try like crazy to get past the issue with the paper. I generally only write on one side of the paper, so I’m feeling hopeful! 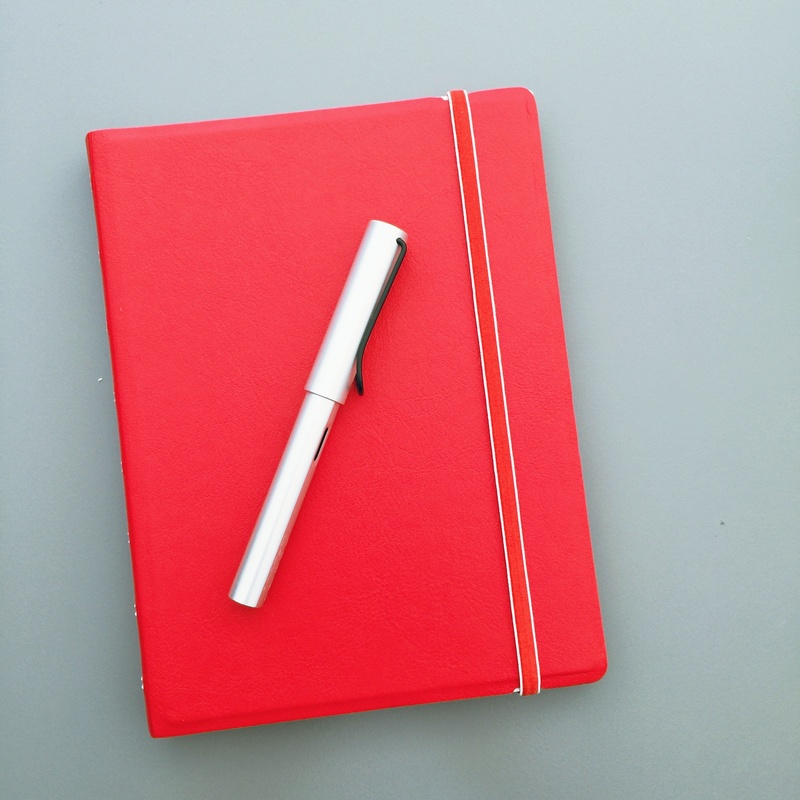 You tell me – could you love this notebook? Is the paper issue a deal breaker? 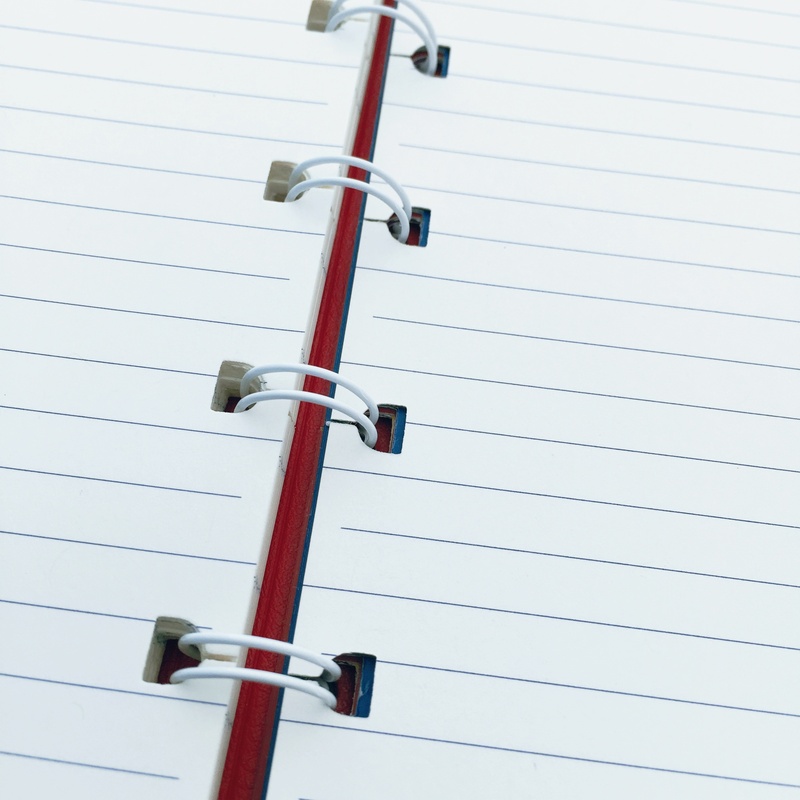 Do you know how this paper performance compares with other Filofax items? This entry was posted in PAPER and tagged filofax, notebook, paper review by Christine (Pentulant). Bookmark the permalink. Soooo glad you reviewed this as I’ve been thinking of trying one. I think the paper works BETTER in this than in the Filofax planners. I KNOW my fountain pens bleed worse in the planner pages. Perhaps a not so dark ink ??? I’ll definitely try one now though. Great review. I have been considering this notebook and your review has helped with the decision. Thanks! I have the turquoise A4 version of this – I agree with the positivity – I too love my notebook. The cost is ridiculous but as you say, it is refillable! 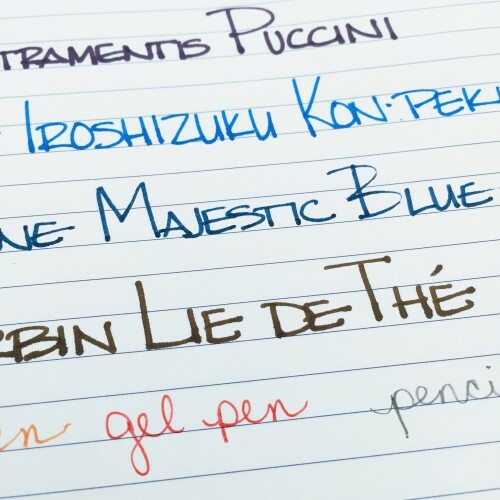 I use a Plooms pen broad nib, with turquoise ink (seeing a theme?). 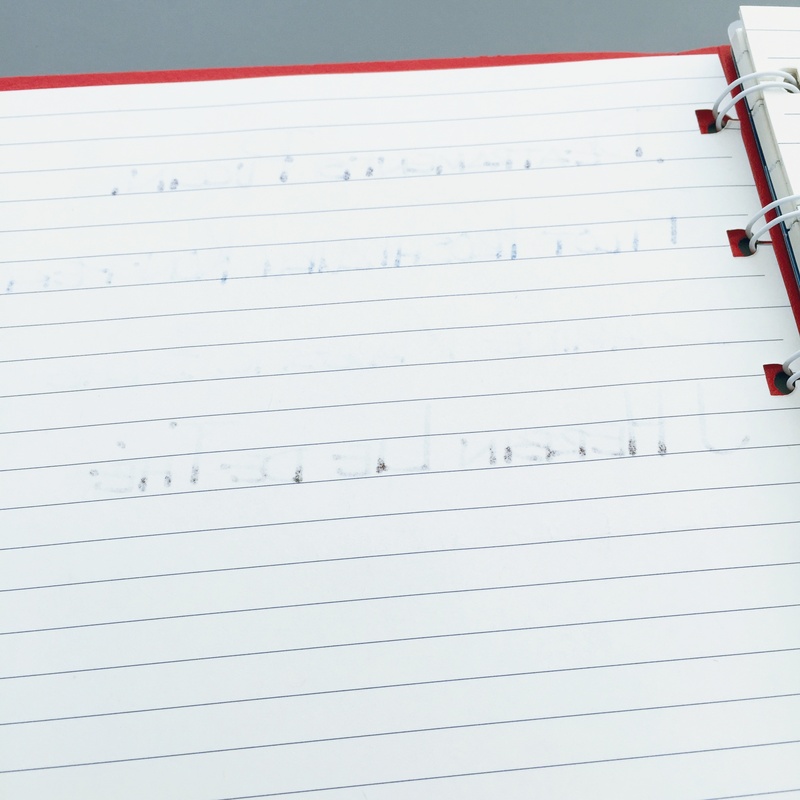 I have to say it doesn’t write brilliantly on this paper – a bit too absorbent I think which makes the pen drag a little (not a problem on any other paper) BUT having said that, generally speaking, I don’t get bleed through with this pen. Right now – Black Friday – the Filofax website has a B1G70% off Black Friday Deal on these and they come in MANY DIFFERENT SIZES AND there are Ll sorts of accessories and types of paper. Don’t know whether Target has the graph paper inserts, the insert tht will hold a pen, the inserts with many different calendar permutations – dated and undated. Glad to see your review. I want a smaller one to put I. A purse (I’m an “Old Bag” of 65 . . . forgive the bad pun) and though my iPhone is handy for appointments, I still need a notebook for jotting down notes. I’m a writer and need to record impressions, details, lines of priose and poetry etc). i only just discovered this. 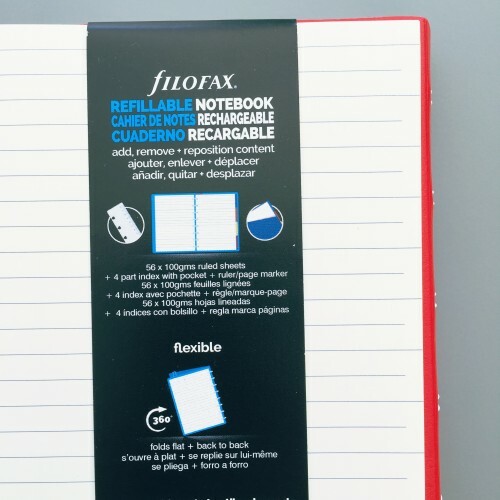 i never went near filofax for the ridiculous pricing, in the past, but this seemed like the ideal solution to have more flexible solution to bulletjournalling combined with projects and art pages. 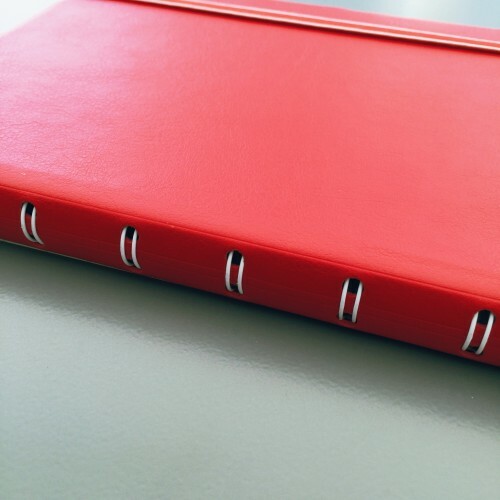 rather than filling and filing a whole leuchtturm or the like, i could archive some pages, and then continue on w project pages, logs etc.. very keen. the book itself isn’t too dear, but obviously.. reacharges.. paper quality is still important, so have just looked around and seen some people complain.. that is disappointing. i mean.. an ok investment if I was to finally be able to neatly put anything, and i mean any type of paper, maps, photos, drawings etc.. into the book.. maybe? I am going to buy one of these, and see if i like it enough. thanks for your review.